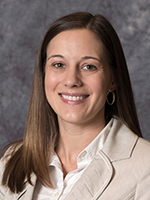 School of Pharmacy Associate Professor Dr. Jamie McConaha recently obtained two additional grants to continue her work in smoking cessation. Tobacco Free Allegheny has provided $4,000 in funding, and $8,777.50 was received from the Pennsylvania Department of Health. McConaha serves as the Course Coordinator for Duquesne's Certified Tobacco Treatment Specialist training program. She became certified as a CTTS in 2013, and obtained her National Certificate in Tobacco Treatment Practice (NCTTP) this year. With this expertise, McConaha developed a group smoking cessation class, which has been taught to over 200 patients over the past few years. McConaha offers these services to patients in her family medicine practice group, as well as for patients across the county through collaboration with Tobacco Free Allegheny.